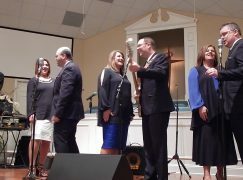 I recently had the opportunity to see The Williamsons in a full concert. I had first seen the group during one of the regional/featured artist showcases at NQC and really enjoyed them. Thanks to Roger Spears with the Butler Music Group, I found out that this group from Oklahoma would be singing in Tennessee on a day I could attend. The concert was part of the Fabulous Friday Nights Gospel Music Dinner Theater summer season at The Barn at Bear Hollow which has featured other artists Heaven’s Mountain Band, Master’s Voice, Troy Burns Family, Eighth Day, and coming up on July 24th, Tammy Jones Robinette. 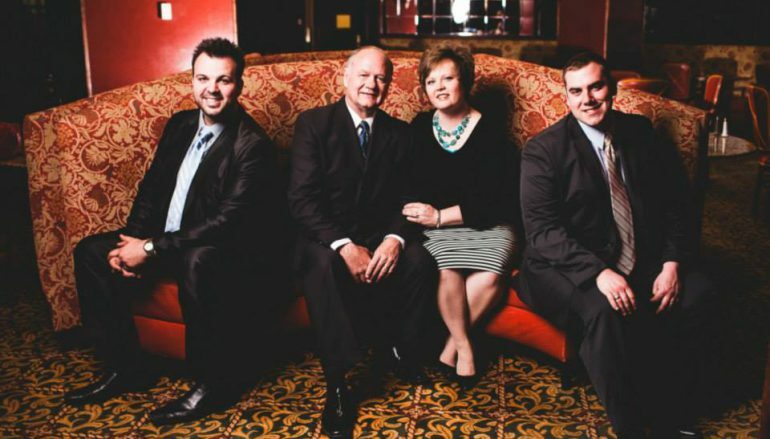 The Williamsons’ members are Donnie and Lisa Williamson, Darin Hebert, and Karl Rice. I had seen Karl during his time with the Anchormen but had not had the chance to meet the others before NQC last year. I would say that much of their music has definite country influences but they have quite a variety of songs in their program. They had a keyboard on stage but they ended up just singing with their tracks. And we even had a short visit from a gentleman named Chesterfield!! He Is Leading Me – This was a solid start with Lisa taking the melody and a short feature of the men in a trio configuration. 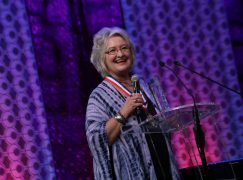 It Was the Word – This is the song that impressed me at NQC last fall! It made it to #5 on the Singing News chart. Here’s a video from that performance. I Laid It All Down – This was a slower song and featured Donnie. God Made a Way – This song featured bass Darin Hebert on the chorus. He can sure rattle the rafters with his low notes! Children of the Dust – This was a very well done cover of the Freemans’ song. He Lived to Tell It – Darin was featured on this Dianne Wilkinson song. 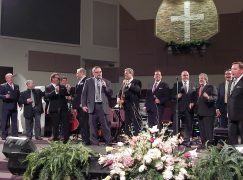 He Lifted Me – Bo joined the men of the group to sing this song as a male quartet. Waving On The Other Side – Bo, Sadie, Lisa, and Darin performed this one for us. Shout – This lively number is their current single and it’s already up to #13! 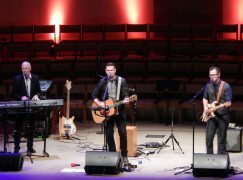 The Promise – This was a cover of The Talleys song and showed their style versatility. How Great Thou Art – This featured Bo on the trumpet but had some vocals on it, too. God Bless the USA – I’m glad they sang this song for us, especially since it was the July 4th weekend. I’ve Got To Tell Somebody – I would consider this closing song a challenge! Lisa was featured and Karl played his harmonica on this one, too! Sadie and Bo joined for the ending of the song. I want to also give a few quick thoughts about The Williamsons’ newest CD, Tell Somebody, that was released last fall. They sang several of the songs from the new album at the concert and the songs they have sent to radio have done extremely well!! This CD has something for everyone and has a great roster of songwriters. You can hear previews of the songs on their website. I usually prefer male quartets but I am really enjoying this album! Toward the end of next month The Williamsons are going to be in Southern VA, about 2 hours south of where I live. Since you just got done hearing them in concert, Diana, would you say it would be worthwhile for me to make the 4 hour round trip to go hear them? My neck of the woods rarely gets good groups coming through. Yes, I definitely think it’s worth it!! My trip was longer than that!! Ok! You convinced me, Miss Diana. :-) Now here’s hoping my schedule allows me to go. I believe Tell Somebody is one of the top 2 SG CDs of 2014. The other being The Kingsmen’s Battle Cry.